Arcade is many things. As Arcadia, it’s the town built by the survivors of post-apocalyptic Earth in “The 100”. It’s the province of the ancient world where the cult of Pan originated, and the name of French Americans and Canadians which originated the term “Cajun”, now linked to Louisiana. It’s the name of the ship that transported the dinosaurs in Jurassic World. 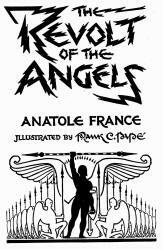 Arcade also has a place in Satanic literary tradition: in his book Revolt of the Angels, Anatole France created a literary character, Arcade, who rebelled against Jehovah after learning atomism and science. An Epicurean under-current exists throughout the work: the bed-side book that the angel was reading during his awakening was Lucretius’ On the Nature of Things–particularly, the copy that had Voltaire’s notes. Mention of Gassendi is also made. The novel reminds one of the series Once Upon a Time, where everyday characters in our world derive their transcendental identities from their heavenly origins–but instead of being drawn from fairy tales, these characters are drawn from the angelic hosts. It also reminded me of the series Lucifer–which was recently cancelled by its network and will be rebooted on Netflix to give fans (who were clamoring for more) some semblance of closure. Its main character is based on the Neil Gaiman character Lucifer Morningstar, and–as in Revolt of the Angels–it precipitates fallen angels into modern cities, living modern lives while evolving and going on adventures as their archetypal characters. Friends, if victory is denied us now, it is because we are neither worthy nor capable of victory. Let us determine wherein we have failed. Nature shall not be ruled, the sceptre of the Universe shall not be grasped, Godhead shall not be won, save by knowledge alone. … In these silent realms where we are fallen, let us meditate, seeking the hidden causes of things; let us observe the course of Nature; let us pursue her with compelling ardour and all-conquering desire; let us strive to penetrate her infinite grandeur, her infinite minuteness. Let us seek to know when she is barren and when she brings forth fruit; how she makes cold and heat, joy and sorrow, life and death; how she assembles and disperses her elements, how she produces both the light air we breathe and the rocks of diamond and sapphire whence we have been precipitated, the divine fire wherewith we have been scarred and the soaring thought which stirs our minds. The rebel archetype is cast in heroic and noble relief when, at the crucial moment, Lucifer chooses not to take heaven from its former inhabitant, fearing that if he did, he would become in the end like his arch-enemy. He expounds the details of this choice to his angels in an epic speech, which gives the author an opportunity to furnish his critique of religion through the mouth of the Light-bearer. It may sound like a creature out of HP Lovecraft mythos, but it’s not. Ialdabaoth is a name for the Demiurge (or Divine Craftsman) in the Gnostic tradition which was popular in Egypt when Christianity was young. The idea of the Demiurge ultimately has its roots in Platonism–and, in fact, Arcade exhibits a strong anti-Platonic spirit when he engages in debates with monks in a chapter which is just one of the many gems of great value in the novel. The Demiurge is a false God or angel–syncretized also with the angel Ariel–who, out of vanity or ignorance, believes himself to be the one and only true god of the universe and seeks to convince all in heaven and Earth that he is to be worshiped as the only God. Naturally, he was syncretized into Jehovah of the Jews and Christians. It’s possible that this tradition emerged as a way for people in a world that had always been polytheistic and was heavily influenced by Plato to make sense of the petty jealousy and megalomania of the deity of the desert tribes. If the God of the Jews is the Father of Lies, then the Father of Jesus must be a different person–to think otherwise would create too much cognitive dissonance, and history has shown that syncretistic appropriation is a convenient way for religious populations to resolve conflicts of this sort–hence the Ialdabaoth tradition, which had deep roots in Gnosticism. Gnosis means “knowledge”, so those who elaborated this tradition would have thought of themselves as being “in the know” and capable of explaining the contradictions that perplexed those who delved into these matters. This proved quite popular, particularly in cosmopolitan Egypt, where people were often challenged with a vast variety of knowledge from different sources. But the Gnostic flavor of Christianity would not survive. The Pauline Church of Rome sought by all the means at its disposal to do away with Gnosticism–as well as with any other competing version or interpretation of Christianity or the Bible–and to firmly establish its own salvific and exclusivist interpretation. This best served the interests of a Roman empire seeking to consolidate and to TEST the loyalties of its subjects. The attack on the Gnostics was not entirely a fruitful campaign because Anatole France, the author of Revolt of the Angels–who lived between 1844 and 1924–knew of the Ialdabaoth tradition decades before the Nag Hammadi scrolls were discovered and forever changed our ideas about the diversity that existed within primitive Christianity. Some of the more paranoid end-of-days cults within Christianity (like Jehova’s Witnesses) also teach that the true god of this world is indeed the devil, but they seem oblivious as to the Gnostic roots of this tradition. Either way, I think that understanding the Ialdabaoth tradition is useful (but not necessary) to the enjoyment of this work. I absolutely relished every page of this novel. The html version available from The Gutenberg Project was translated beautifully into English by Wilfrid Jackson–and I’m sure the French original is just as delicious and refined. Anatole France was an award-winning author and a member of the Académie Française who sympathized with the revolutionary ideas that were en vogue in early 20th-Century France, as Russia fell into the hands of the proletariat. The historical period and the solidarity that existed in the Parisian left at the time the book was written, add another layer of complexity to the novel. I believe atheists, humanists and Epicureans will derive the most pleasure and inspiration from this book. It is ultimately a book about rebelling against religious tyranny and totalitarianism. This entry was posted in Atheism, Books, Review and tagged angels, satanism. Bookmark the permalink.